On March 29th 2019 the United Kingdom is scheduled to leave the European Union. For seventeen months the British government and the EU negotiators have been struggling to reach a legally binding “withdrawal agreement” to govern the terms of UK withdrawal, including the “divorce bill” or the sum the UK pays to settle its obligations to the EU, and a “political declaration” outlining the basic shape of a final deal after further negotiations. On November 13th a draft deal was finally agreed and immediately a storm broke around Tory Prime Minister Teresa May. Her proposed way forward seems to please almost no-one. 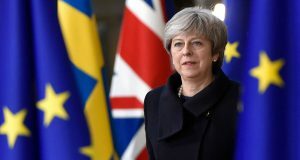 She pushed the deal through her cabinet without taking a formal vote and within hours three ministers had resigned, including Brexit Minister Dominic Rabb. When she defended the draft deal in the House of Commons it was a full hour before a single MP stood up to endorse her position. Both the hard Brexiteers and the Remainers in her own party declared their intention to vote against, as did the Labour Party, the SNP, and the DUP, effectively her partners in coalition. The Brexiteers went further than verbal opposition to the deal. The leader of the European Research Group, Jabob Rees Mogg, launched a bid to remove her from the Tory party leadership by declaring his own intention to submit a letter calling for a vote of no confidence. Within 48 hours of the publication of the draft deal it appeared to be all but dead, and Teresa May appeared to be finished. Yet May survives, at the time of writing, and the draft deal will almost certainly be put to a parliamentary vote in the coming weeks. Whether she does survive, and what the consequences of the last week’s tumultuous events are remain to be determined. Meanwhile the draft deal has come under intense scrutiny and has been criticised from every angle. The draft Brexit agreement accepts that the UK will remain in the EU until at least December 2020. It outlines how the UK and the EU will “use their best endeavours” to have a future trade agreement concluded six months before the end of the transition period in December 2020, but that if this is not achieved the EU and the UK could “jointly extend the transition period” for a as yet unspecified period. If a free trade deal is not agreed, or an extension is not put in place, than a backstop solution for Ireland and Northern Ireland aimed at preventing the creation of a hard border would come into force. Crucially in this scenario there would be extra non-customs checks on some types of goods passing between Northern Ireland and the rest of the UK: in other words an ’East-West” border could begin to emerge as early as December 2020. This is what the DUP are objecting to so vehemently-a set of circumstances in which a border between Northern Ireland and England, Scotland and Wales would be put in place and would harden over time. And even worse in their view, the Southern government would have more say over these developments that the UK government. There is an element of truth in this as under the draft agreement clauses the EU will continue to make new rules which may apply to the North but over which the UK government has no say. All this will be unfolding as unionists mark the 100th anniversary of the creation of Northern Ireland after partition. The symbolism for unionism is profound. It is suggested that inspections of goods do not necessarily have to take place at Irish Sea ports or airports but all such suggestions are doing little to “sugar-coat he pill” for the DUP. Any separate status for Northern Ireland from the rest of the UK is anathema to the DUP. The DUP, have repeatedly said they would not accept any additional Northern Ireland-only checks no matter where or how they take place. Tory Brexiteers are raising the same issues as the DUP, in part for cynical, tactical reasons, but focus their opposition on other aspects of the draft agreement. For example, the agreement says that if “either side considers the backstop is no longer necessary, it can notify the other” setting out its reasons. A joint committee must then meet within six months, and both sides must agree jointly to end the backstop. This means that the UK cannot unilaterally pull out of the backstop. This has enraged Brexiteers who demand the right for the UK to exit any all-UK customs union as and when it wants in order to be able to pursue free-trade deals around the world. Socialists oppose these clauses for the opposite reasons. The EU is trying to severely limit the room for manoeuvre of a Corbyn-lead Labour government, especially with regards to its ability to nationalise industry or banks. This is nothing to do with the EU seeking to protect workers’ rights after Brexit must be exposed. Workers’ rights have been won through struggle, and will be defended through struggle. The EU cares nothing for workers’ rights, as the people of Greece know to their cost. The crisis of the last few days has dramatically increased the prospect of a no-deal Brexit, in which the UK simply crashes out. Many millions of working class people across Ireland and Britain, are fearful of the consequences of such a chaotic outcome. Whilst there is exaggeration on both sides of the debate, with “Remainers” predicting Armageddon and “Brexiteers” looking forward to the sunny uplands of a UK “freed from the shackles of Europe”, not all the fears regarding the possibility of a no-deal Brexit are irrational. A sudden and sharp economic shock would result. There would be real impediments to trade, probably most visible where long queues of lorries build up at the Channel ports. An economic recession would almost certainly follow. The Bank of England has signalled its intentions in advance to lower interest rates again and pour money into the economy in order to ward of recession but it is widely accepted that its room for manoeuvre is very limited as interest rates are already so low and the economy is awash with the colossal sums injected since the 2007-2008 financial crisis. A fall in living standards would be most likely, as inflation would rise and wages fall in real terms. If the hard-right Brexiteers are by then the dominant force in the Tory government workers are right to fear a race to the bottom and attempts to create a low-tax, low-wage, unregulated economy. If there is a chaotic Brexit the EU and the Irish government will have to decide what happens at the border. At present goods and services are traded between North and South with few restrictions. As the UK and Ireland are currently part of the EU single market and customs union. After a hard Brexit the logic of the workings of the EU is that a hard border would have to be put in place, and even this possibility is causing anger in the Catholic community. Teresa May is arguing forcibly that the only way to avoid such a calamitous scenario is her way. She has the backing of most business organisations and most of the big corporations. Since last week she has had the backing of most of the right-wing and pro-Brexit press. She is the ‘safe pair of hands’ for British capitalism. On the other side of the negotiating table were her equivalents, acting in the interests of the dominant business interests of the EU 27. It is not as simple as that of course. The negotiators of the ruling class will seek in the first instance to protect trade and profit but are hamstrung by other considerations, of national interest, and of political pressure and electoral arithmetic. The UK Tory government has been weak and fractured since the 2017 General Election. Teresa May is in an extremely precarious position- her government is on a political cleft stick. She feared a rebellion from her hard-right pro-Brexit MPs and an open attempt to remove her if she conceded too much to the EU and was not seen to deliver on a clean break with Europe. Boris Johnston and other are as sharks circling her in the water, waiting for the first scent of blood before striking. Her negotiating strategy was shaped by this consideration. She also had to look over her other shoulder however. There are a small but not insignificant number of anti-Brexit Tory MPs who also threatened to withhold their votes if they thought a proposed deal was too hard. And she knew that she would lose ten DUP votes if she in any way was seen to weaken the link between Northern Ireland and Britain. She must have thought that she was damned if she did and damned if she didn’t, potentially losing votes on either flank, and sought to chart a middle course and please both wings. It hasn’t worked. In part this is because the EU drove a hard bargain. The EU is concerned to allow May wriggle-room, as it would much prefer her government to survive and deliver an orderly withdrawal. It fears the alternative scenarios of a hard Brexiteer- led government or a Corbyn-led government. The EU negotiators wanted a deal which kept May in power but above all it is concerned to protect the European project. It cannot concede on the core “four freedoms”-free movement of people, capital, goods and services –without inviting EU-sceptic parties in a host of European countries to seek to take advantage. If the UK is allowed the benefits of free trade, but without free movement of people, there will be a revolt. It will open a Pandora ’s Box as both existing governments, such as the ultra-right Hungarian regime, and rising right-populist movements in most European countries, demand the right to opt out of whatever aspect of EU rules they wish to. Despite this May’s preferred way forward has not changed-all the indications are that she will push ahead and put the draft agreement before MPs, even in the expectation of losing first time around. She then might be hoping for a successful second vote if a period of political chaos and developing economic crisis (as the pound and shares fall) opens up, and this then forces a re-think by a sufficient number of MPs. In this context the EU27 might come forward with minor concessions, and this might just see the deal over the line. The possibility of such concessions has been hinted at, even when EU negotiators are stating in the same breath that no further change to the draft agreement is possible. This scenario-the draft agreement winning parliamentary approval, and May surviving as leader for a period-is possible but far from assured. For now it does not seem likely that the required 48 Tory MPs will write to the chair of the 1922 Committee to force a leadership contest, but this may yet happen. Five Tory pro-Brexit cabinet ministers have formed an alliance and are pushing for changes in the draft agreement. If they are unsuccessful they could then pull the rug from under May and resign from the cabinet, her position would become untenable and it is most likely that she would resign. In such a scenario and then Boris Johnston or another Brexiteer will challenge for the leadership. Alternatively a compromise candidate may emerge-an “anyone but Boris” candidate. For now however, the cabinet are “united” and the five pro-Brexit ministers are concentrating their efforts on achieving changes in the draft agreement. A second option for May is that she accepts that no deal is possible. This could occur before the first parliamentary vote, but is more likely after an attempt has failed. May might simply then throw her hands up and prepare for a no-deal Brexit. If she does the EU27 will most likely cooperate, pull it all together and seek to avoid chaos that would hurt both sides. A third way forward is a general election. 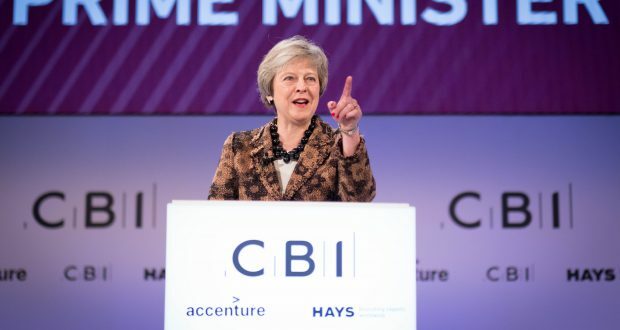 May could choose this option, posing as the only figure who can “deliver the country from chaos” and appealing for votes “in the national interest.” The purpose of an election from May’s perspective would be to return to power with a sufficiently large majority to be in a position to ignore the Brexiteers and the DUP, and such an outcome is extremely difficult to envisage. Labour are ahead in the polls and in this time of tumult and uncertainty the Tories will avoid an election at all costs, fearing a Corbyn victory. An election thus remains less likely, but such is the turmoil inherent in the situation this could change quickly. A Labour victory, and the return of a Corbyn-lead Labour government, would open up an entirely new vista and would be a hugely positive development. A Labour government should seek to re-open negotiations and demand an entirely different relationship with the EU, based on the interests of working-class people, not the 1%. If no agreement is voted through, and an election is not called, a fourth option for May is to call a second referendum. For now she has ruled this option out completely, but it may yet emerge as the “only alternative” as she struggles to find any way forward. When all other options have failed the unthinkable becomes unthinkable. The reasons why May and the EU are stuck at this point on the journey are many, but key is the question of the border on the island of Ireland. For weeks Teresa May and the EU have both been declaring with confidence that “95%” of the contentious issues were agreed. They admitted that they were stuck on the other 5%-the need to agree a backstop to avoid a hard border in Ireland. The backstop is a position of last resort, to protect an open border on the island of Ireland in the event that the UK leaves the EU without securing an all-encompassing deal. There is widespread disbelief that such a seemingly “minor” issue could be preventing an agreement which would allow a solution which would satisfy all sides to emerge. In order to “explain” the lack of an agreement many commentators argue that the Tory government is being “held to ransom” by the DUP. There is some truth in this of course, but it is an argument which ignores or downplays the difficulties which would have come into play in any case. Focusing on the DUP-Tory arrangement is a way of avoiding the real issues. It is not just an accident of electoral history which is the problem. Even if the parliamentary arithmetic had been different after the last general election, and the DUP and the Tories had not entered into a “confidence and supply” arrangement, the ruling class would have still have to weigh up the opposition of Northern Ireland Protestants to any perception of an East-West border being created. The real reasons for the difficulties in reaching agreement on Brexit are not because of the accident of political history which has left the DUP holding the balance of power at Westminster but are a fundamentally a consequence of the inability of capitalism to achieve a lasting solution to the national question in Ireland. In the 1980’s the “Economist” magazine wrote that the Troubles in Northern Ireland were “a problem without a solution”. This seemed a rational conclusion at the time but then the 1998 Good Friday Agreement gave the appearance of falsifying this prognosis. In fact the Good Friday Agreement did not represent a solution then or now. This has become more than apparent in the nearly two years since the collapse of the power-sharing Executive in January 2017. Northern Ireland now holds the world record for the longest period of time any political entity has stumbled on in the absence of an elected government (though its status as a devolved region within the UK means that it is not without any form of decision-making process). Today the national question in Ireland is not just a headache for the British ruling class but a thumping migraine for the EU 27. One hundred years ago the arch-imperialist Winston Churchill (February 16, 1922) pointed wearily to the seemingly unsolvable problem of the national question in Ireland: “The whole map of Europe has been changed … but as the deluge subsides and the waters fall short we see the dreary steeples of Fermanagh and Tyrone emerging once again. The integrity of their quarrel is one of the few institutions that have been unaltered in the cataclysm which has swept the world.” Churchill and his ilk caused the “quarrel” in the first place, through a policy of colonial exploitation and deliberate “divide and rule”. Now the “dreary steeples” are haunting his political heirs, and they are visible across Europe. Negotiating Brexit was never going to be easy, but with the addition of the Gordian knot of the border has become to seem close to an impossible task. Both the DUP and Sinn Fein deliberately inflame sectarian tensions every day of the week-it is their political DNA. Both parties are using Brexit in order to widen divisions: the Brexit debate has become inextricably entwined with the ongoing war of attrition between sectarian forces in Northern Ireland. Sinn Fein has become the champion of the EU and fierce opponents of Brexit. The fact that Sinn Fein was an opponent of the EU until a few years ago is now largely forgotten (until 1998 Sinn Fein was in favour of EU withdrawal). Today of course Sinn Fein has overturned many of its previous positions. Any veneer of socialist radicalism has long worn off. It is not only in favour of remaining in the capitalist EU but it is a proponent of a dramatic cut in corporation tax rates for big business. In order to deliver this cut it moved to cut over 20,000 public sector jobs in the North alongside its then coalition partners in the DUP. Northern Ireland voted against withdrawing from Europe in the 2016 referendum by 56% to 44%. There was a clear difference in attitudes between Catholics and Protestants: Catholics voted overwhelmingly voted to stay by a proportion of 85% to 15% while Protestants voted to leave by a proportion of 60% to 40%. As in Britain there was a class divide evident in the vote-almost 80 percent of those classed as “professionals” voted to remain while approximately half of manual workers and those on state benefits did so. The Catholic vote for “remain” requires analysis and explanation. Many Catholics, in particular the young, voted for the EU because for them it represents their outward-looking and internationalist approach to the world. This is a positive impulse, shared by many of the young Protestants who voted remain. Catholics are often convinced that the EU has brought real material benefits to their lives, through new roads and other infrastructure, and that it has granted rights which otherwise would not be available. It is important to state clearly that the EU is not the guarantor of anyone’s rights in any real sense (unless we count the right of bankers to be bailed out at any cost). Nor is a body which acts in the interests of ordinary people. Perceptions are important however, and now many Catholics consider the EU to act as a bulwark “protecting” their rights. Furthermore the EU has become associated with the disappearance of the border as a physical barrier for many Catholics, and by extension now belonging to the EU has an important expression of their national aspirations. The extent to which the peace process diminished the reality of the border has been exaggerated. The border still exists, with different currencies, laws and regulations on each sides and some border checks still occur, not just on agricultural products, but also on people. Nevertheless the border has disappeared in the sense of an everyday impediment, and this has had an impact on the consciousness of Catholics over the last twenty years. There is thus real opposition in the Catholic community to any hardening of the border between North and South. The degree to which the border will be “hardened” in the context of a no-deal scenario has been exaggerated but for Catholics, especially those living along the border, the memory of army watchtowers and listening posts is raw, and even the possibility of border checks is causing intense anger and real fear. Paradoxically the disappearance of the border as a physical barrier has been one factor in allowing many Catholics to become more reconciled to the existence of the Northern Ireland state-that is, to the reality of the border. The possibility of the hardening of the border is now having the opposite effect, and is contributing to the rapid stripping away of the acceptance of no change in Northern Ireland’s status which Catholics largely acquiesced to for a period after the Good Friday Agreement in 1998. Brexit is injecting new instability into an unstable situation. If a withdrawal agreement which is seen to be detrimental to the rights of Catholics is pushed through there will be genuine anger in Catholic areas. Threats to pull down any new border infrastructure are not empty threats. Even in the context of a chaotic Brexit the prospects of any actual border checkpoints are very slight, so actual conflict or violence on the border is unlikely, but even the perception of a hardening of the border will alienate Catholics. Dissident republicans would seek to exploit any border infrastructure, targeting buildings and border staff with bomb and bullet. The equal and opposite process is at work in the Protestant community. Protestants recognise the benefits of the absence of a visible border they would prefer no hardening of the border in the future too. They are however utterly opposed to anything which suggests the creation of an East-West border down the Irish Sea. This opposition is very real, despite the fact of an already existing “border” of sorts-there are East-West checks on agricultural products. Any East-West border, no matter how minor, has come to represent a threat to the union between Northern Ireland and Britain. If an agreement is voted through at Westminster which allows for East-West checks after December 2020 against the opposition of the DUP, there will be widespread anger in the Protestant community. In 1985 the Anglo-Irish Agreement was agreed between the governments of Margaret Thatcher and Garrett Fitzgerald without the involvement of unionist political parties. As far as most Protestants were concerned cross-border institutions had been undemocratically imposed on them and mass protests and an upsurge in violence resulted. In December 2012 widespread disorder broke out when a mere emblem of the “Britishness” of Northern Ireland-the union flag over the City Hall in Belfast-was removed. If there is a perception in the coming months and years that the British identity of Northern Ireland is being diminished street protests and street violence cannot be ruled out. All of Europe may look on in astonishment and confusion as anti-EU and anti-British government riots break out in Protestant areas of the North. In this context a marriage of convenience between the Brexiteer wing of the Tories and the DUP would act to magnify political crisis and increase tensions. The draft agreement outlines a scenario in which there will be a developing East-West border. This will inflame opinion in Protestant working class areas. The opposite scenario, in which there is a hardening of the North-South border, will cause anger in Catholic areas. Either “solution” is no solution, and will cause harm to the cause of working class unity. This is the context in which the Socialist Party has considered the draft agreement. It is first and foremost a question of weighing up the impact of any political development on divisions in the North and across the island of Ireland. The Socialist Party strives to build support in working class communities across Ireland, including in both Protestant and Catholic areas of the North. We base our party on the organic unity of the working-class: Catholics and Protestants have more in common than divides them. This unity is strengthened through the shared struggle for a better life-in industrial disputes in the workplaces, in campaigns in local communities to defend our services, and in the struggles for abortion rights and the right to an equal marriage. This unity has to be fought for and cannot be taken for granted. Sectarian forces consciously strive to increase division and must be countered at all times. The unity of working class people is our over-riding priority and we oppose any moves which tend to weaken that unity. The draft agreement outlines a scenario in which there will be a developing East-West border. We oppose any hardening of borders, either North-South or East-West. Any hardening of borders is unnecessary and will increase sectarian tension. We are thus opposed to the draft agreement on the basis of the threat it poses to the unity of working class people. The Socialist Party will always oppose any deal which is agreed in the interests of capitalism. The draft agreement has been negotiated and agreed in the interests of big business. The Socialist Party is opposed to the EU, which is an institution created in the interests of capitalism. It is no friend of any worker in Ireland, North or South, or of any worker in England, Scotland or Wales, or across Europe. Working class people cannot and should not rely on the EU to deliver a brighter future, any more than they should rely on the anti-working class governments of Leo Varadkar, of Teresa May, or on the DUP-Sinn Fein Executive if and when it returns to power. We do not take an abstentionist position and we believe that it is vitally important that the workers’ movement-the trade unions and genuine left political forces-intervenes at this time with an independent and left programme. The workers movement should draw its own “red lines” on the key issues. For years the Socialist Party has stood with workers in opposition to all attacks on jobs, wages, and conditions, whether these attacks result from the directives of the EU, or from governments North or South. We do not recognise any hierarchy of bosses or capitalist governments, in which some are “less bad” than others. The Socialist Party will now stand with workers resisting any attacks resulting from the process of the UK withdrawal from the EU. Trade unionists in Ireland are organised together in the Irish Congress of Trade Unions and are linked with their fellow trade unionists across England, Scotland and Wales in the TUC. The workers movement must mobilise to defend the wider interest of working class people across these islands. 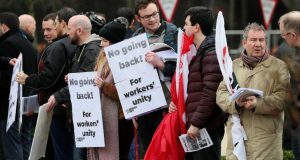 • The trade unions must defend the economic interests of the working class in Ireland North and South, and in Britain, and resolutely oppose any “race to the bottom” with regards to workers’ rights or standards (of food production, for example). The workers movement must prepare for industrial action to defend workers’ jobs, wages, conditions, and rights. • The workers movement must also act to defend the unity of the working class, and must not come down in favour of any agreement which widens divisions. It is also necessary to counter any increase in sectarian tension and sectarian conflict, and to prepare for protests and demonstrations, and industrial action to challenge sectarian forces. • An emergency conference, with the widest participation of workers representatives from workplaces across Ireland, North and South, must be convened, in order to allow a full democratic discussion on how to best oppose both the EU and the attacks of the Fine Gael and Tory governments. If the ICTU will not convene such a conference those trade union bodies who are prepared to do so much take the lead. Trade unionists in England, Scotland and Wales should be asked to send representatives to this conference. The workers movement must also link out to trade unionists across Europe who also facing attacks originating from the EU. • Socialists in Ireland would welcome the return of a Labour government in Britain. If such a government were to adopt a position of socialist opposition to the EU this would transform the situation. A Labour government should seek to re-open negotiations and demand an entirely different relationship with the EU, including new trade and customs arrangements, based on the interests of working-class people, not the 1%. This means a rejection of any EU restrictions on the ability of a Labour government to reverse privatisation or nationalise key sectors of the economy. • Corbyn should speak over the heads of the Commission, reaching out to working class people across Europe in rejecting neo-liberal rules, calling for co-ordinated action for Green Energy on a Europe wide basis, and popularising a socialist vision of Europe. A left Labour government would be able to call on workers throughout the continent to fight the ‘race to the bottom’ in their own countries and mobilise against attempts by their own governments or the EU to pursue punitive measures against other workers whether in Britain or elsewhere. The workers’ movement in Ireland should mobilise its resources to build a cross-Europe fight back. A Labour victory, and the return of a Corbyn-lead Labour government, would open up an entirely new vista and would be a hugely positive development. If Brexit threatens workers’ jobs or pay taking enterprises into public ownership, under working class democratic control and management, should be the reaction of a left-led government. In that way, all jobs can be safeguarded and, if necessary, production changed to more socially needed products. • Workers in Northern Ireland have no political voice. We need a new, mass political party which represents the interests of working class people and fights for a socialist future and the election of a Labour government would add great momentum to the struggle for such a party. • Socialists are in favour of a genuinely united Europe. This will only possible when the socialist transformation of society allows the coming together of nations of Europe in a democratic, European-wide confederation. We fight for a Socialist Ireland, with full democratic rights for the Protestant community. We are in favour of a socialist federation of Ireland, Scotland, England and Wales in a free and voluntary federation and a Socialist United States of Europe.